Which Tools are Best for You? Which tools are best for you depends on what it is that you want to do. The questions and answers below will help you to decide which tools are best for you. I’ve taken the guess work out of choosing tools because our online shop only carries tried and true tools. To see which tools are used with which lessons, click here to see the charts below. You’ll get the most out of your tools when you get my lessons that teach you how to make carvings with those tools. With my lessons, you will save the time and frustration of learning by trial and failure. You’ll have carving successes right away. This video will show you how to easily see which tools go with which lessons. 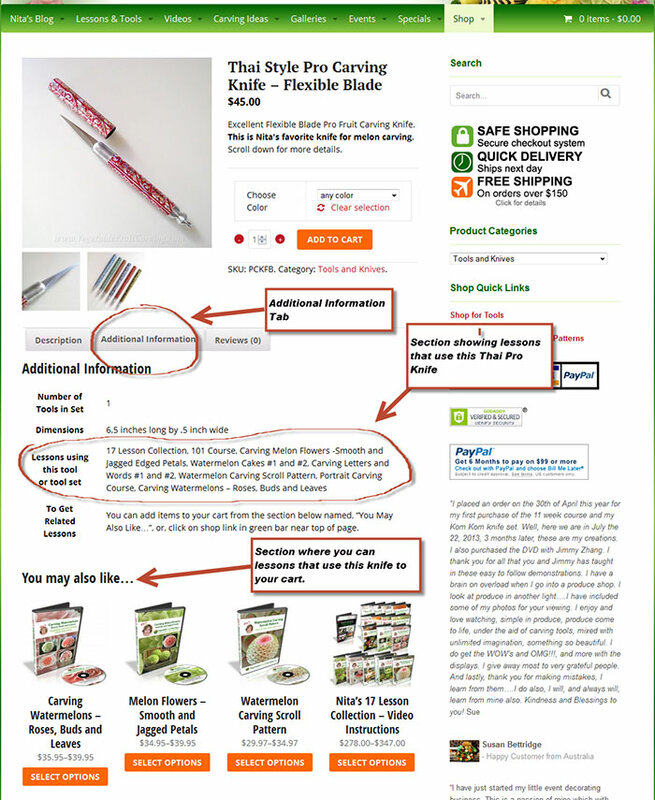 You can easily see which lessons use which tools when you looking at any of the individual tool product pages in my online shop. You can click the ‘Additional Information‘ tab to see what lessons use that tool or tool set. For more info about my lessons, see the Which Lessons are Best for You page. Looking for essential tools to get started? 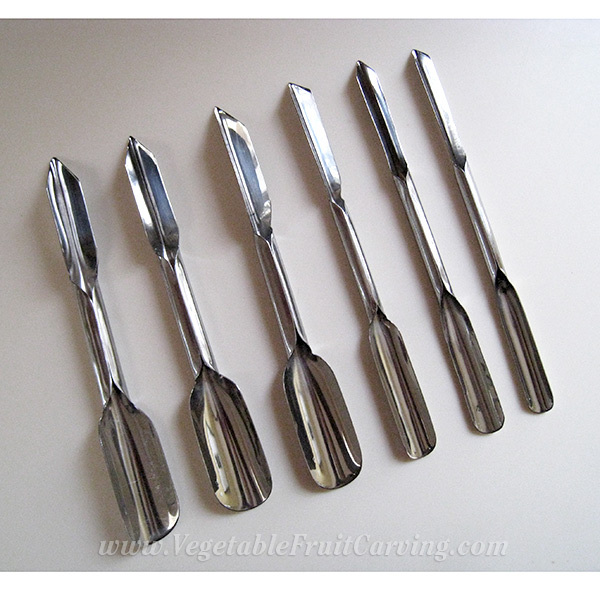 Corrugated U-Cutters with Mini-melon Baller – makes wavy U-shaped cuts. Smooth U-V cutters – makes smooth U and V shaped cuts. 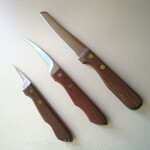 Kom Kom 3 Knife Set – 3 different shaped knives for different purposes. You will learn how to use these 3 tool sets in the 101 Course for Beginners. You can see which individual lessons use which tools and knives in the charts further down this page. What tools are recommended beyond the basics? Additional essential tools for your collection? For carving melons (and many other types of produce), I highly recommend the Thai Pro Knife. Imported from Thailand, it is the best melon carving knife I have found. This knife is used in the last lesson of the 101 Course, in all of the melon and watermelon lessons, and in the Portrait Carving Course. The best lesson begin learning to use this knife is Carving Watermelons – Roses, Buds and Leaves. The 7 Piece Pro Set features larger, stronger, sharper U and V tools and is a great addition to your tool collection. 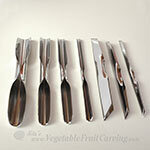 This tool set is is a great addition to any fruit carvers tool kit. If you get one of these 7 piece sets right from the start, you can skip the Smooth U-V set. The 7 Piece Pro Set is used in the Amazing Carving with Jimmy Zhang lessons. 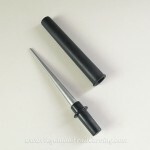 They are used in the Portrait Carving Course, , and can be used in any of the lessons that use the Smooth U-V Cutters. Tool that requires absolutely no skill at all? 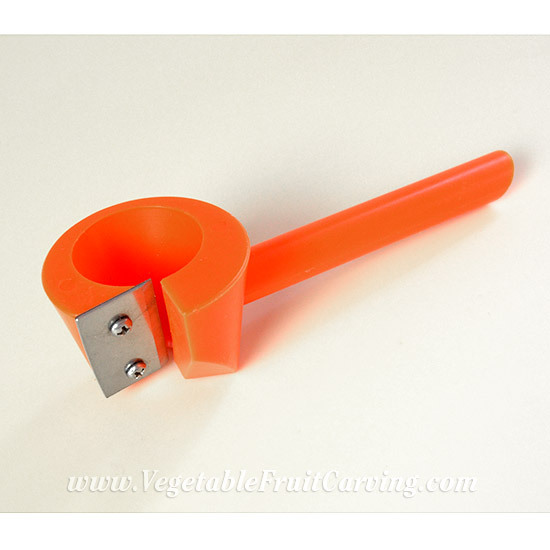 The Carrot Curler is the fastest, easiest way to make flowers from carrot and parsnips. No skill required. If you can sharpen a pencil, you can make pretty carrot and parsnip flowers. This tool is also great for culinary professionals who want a fast way to decorate a plate. The Wavy Peeler, the Vegetable Curler and the Twisty Twirl Tool are also great tools that require no skill at all. You will see photos and short videos showing what you can make with these tools when you click the links for the tools above. 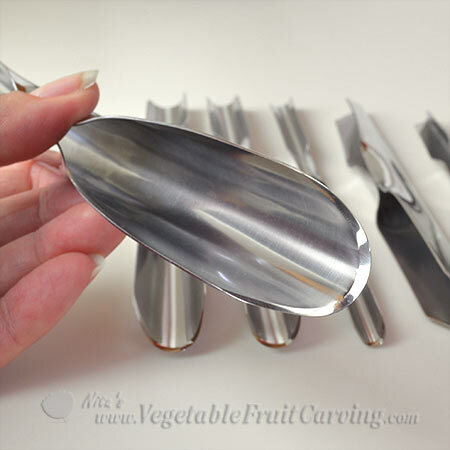 Peeling knife for melon carving? The Peeling Knife is great for peeling melons prior to carving. It is optional for use in most all of the melon carving lessons, the 101 Course and the 201 course. It is thin and lightweight. You might already have a knife like this at home, which is why it is listed as optional. Want to keep your knives and tools sharp? The Knife Sharpener is a handy pocket size. Its perfect for having on hand when you travel and will fit into nearly any tool case easily. It’s great for sharpening both the knives and the tools. It’s small enough to sharpen the small grooves in the Corrugated U-Cutters. Want to make carving words, letters, logos and graphic designs easier? 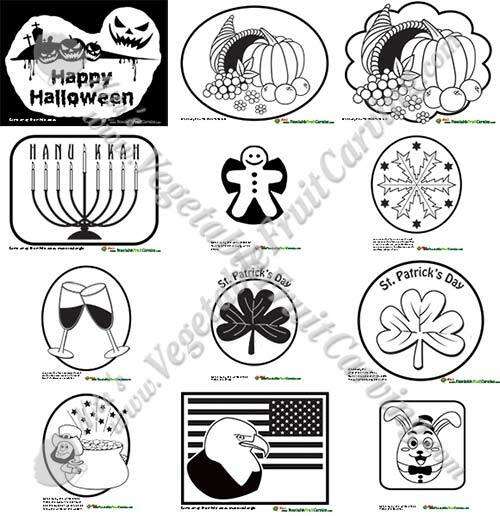 Our Pattern Transfer Paper and our Pattern Transfer Fabric makes carving melons and pumpkins with words, letters, logos and graphic designs, easy. 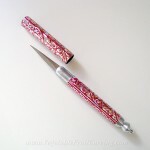 It also makes carving your patterns easier and more accurate so that you get better results. Nor sure which to get, check out our Pattern Transfer Sampler. You can get some of both the Paper and the Fabric in our Sampler. The video on our Pattern Transfer Sampler page will show you when to use which. These pattern transfer products are huge time-savers! You’ll love them. The transfer pattern paper and fabric is used in the lessons, Carving Letters and Words and in the Portrait Carving Course. Although this transfer pattern paper and fabric is optional for these lessons, you will find it is the easiest way to transfer your pattern and have very accurate and impressive results. Do you want to focus on doing specific types of carvings? 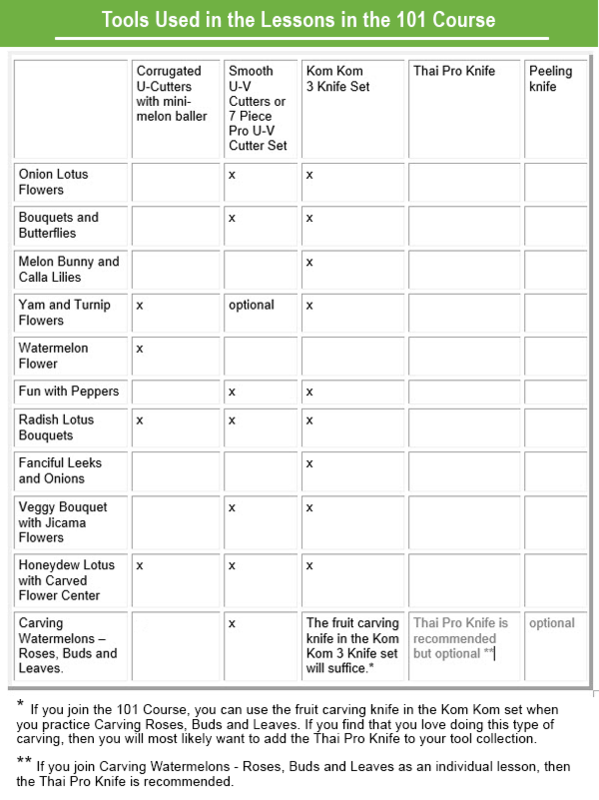 Plan to do a variety of carvings? The 3 basic sets plus the Thai Pro knife will give you plenty of versatility. Smooth U-V cutters – make smooth U and V shaped cuts. Kom Kom 3 Knife Set – 2 different shaped knives for different purposes. 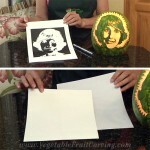 Want to focus on melon carving? Get the Thai Pro Carving Knife. 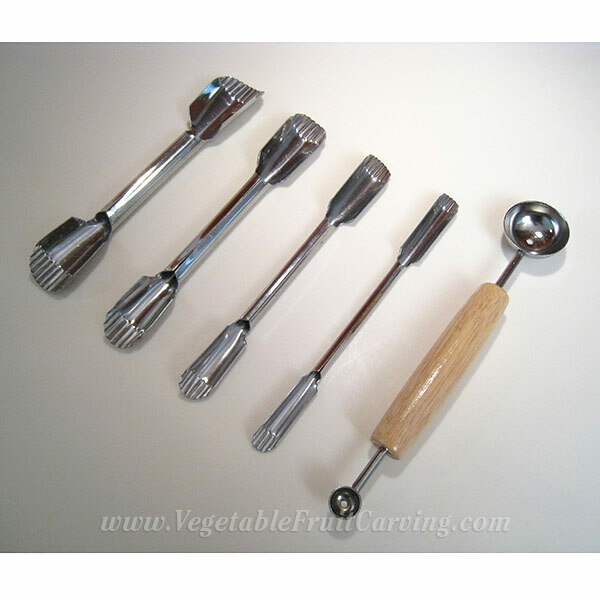 It’s designed specifically for melon carving although it’s great for carving many other types of produce as well. 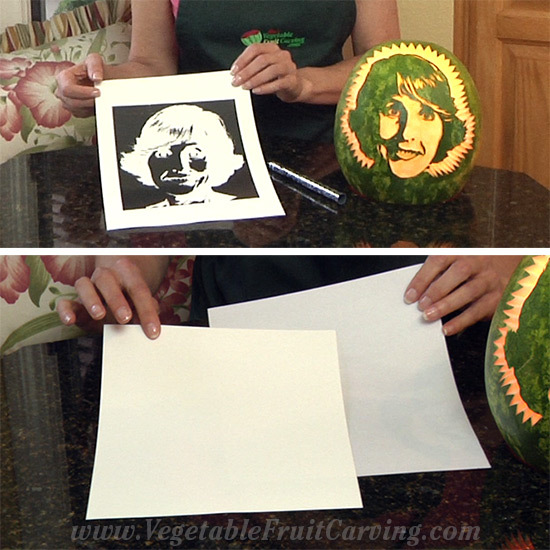 The Carving Watermelons – Roses, Buds and Leaves lessons are the best lesson to begin learning to carve melons using the Thai Pro Knife. 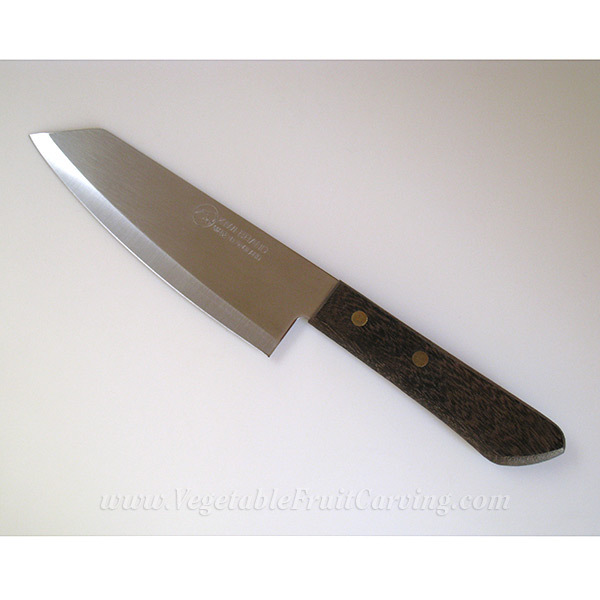 You will find the Thai Pro knife super essential for carving melons as taught in the lessons: Carving Melon Flowers – Smooth and Jagged Petals and, Watermelon Carving Scroll Pattern. This special knife with a flexible blade is also used in the lessons, Carving Letters and Words, and the Portrait Carving Course. Do you love pumpkin carving? If pumpkin carving is your passion, you’ll find the Pumpkin Carving Tools super useful. 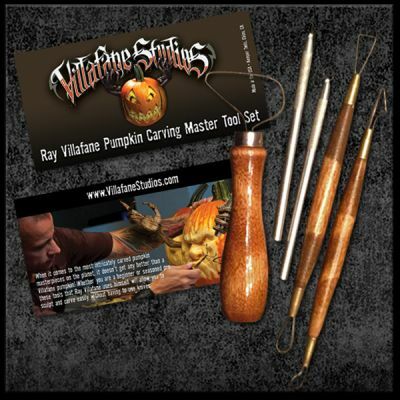 These pumpkin carving tools are used in the Portrait Carving Course as well as in Ray Villafane’s 3D Pumpkin Carving Tutorials. When carving pumpkins, you may also like the Pattern Transfer Paper, or Pattern Transfer Fabric, the Thai Pro Knife and U-V cutters in the 7 Piece Pro Set. All of these are used in the Portrait Carving Course. Not sure when to use the Pattern Transfer Fabric versus the Pattern Transfer Paper? See the video on our Pattern Transfer Sampler page. 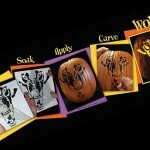 For easy Halloween pattern carving, you might also love the Pumpkin Carving Tattoos. 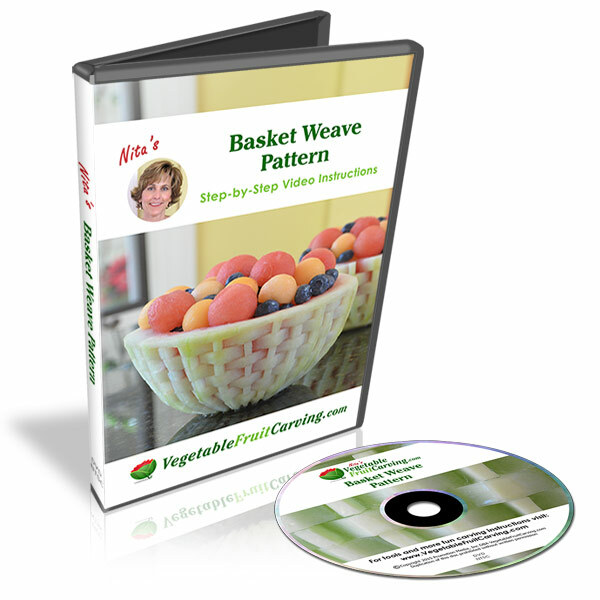 These patterns are simple to use – no lessons required. They come in several different party packs from easy family friendly patterns to more challenging Halloween patterns to ghoulish Ray Villafane inspired patterns. 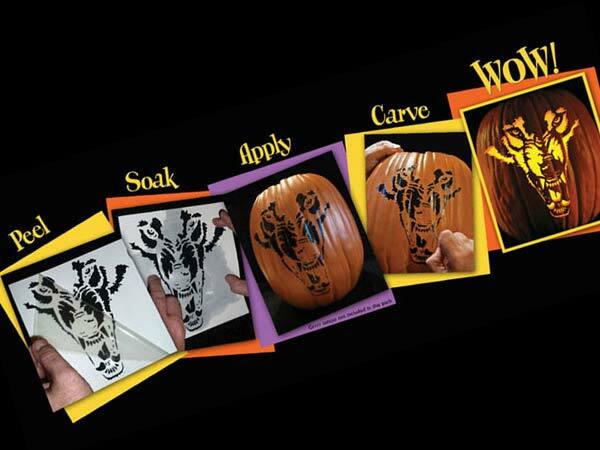 Want to create carvings that you’ve seen in my free lessons? 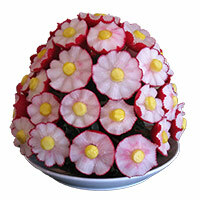 Want to make the radish bouquet taught in my free sample lesson? If you want to make the radish bouquet taught in my free lesson, you will want the Corrugated U-Cutter set that includes a mini-melon baller. If you have not yet seen my free sample lesson showing how to make a pretty radish bouquet centerpiece, sign in below for your free step-by-step Lesson. Want to make the watermelon pedestal bowl you've seen in another of my free sample lessons? You can use any sharp pointed paring knife, the fruit carving knife in the Kom Kom 3 knife set or Thai Pro Fruit Carving Knife. Alternatively, you can use the Smooth U-V Cutters. If you’ve signed up for my free radish bouquet sample lesson, I will be sending you the watermelon pedestal bowl lesson within a couple of days. 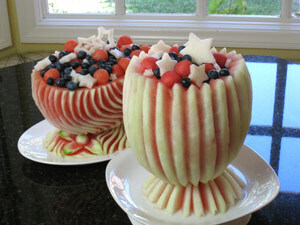 If you want to see the pedestal watermelon bowl lesson now, click here. Want to make the chili flowers you've seen in yet another of my free sample lessons? Then you will want the Smooth U-V Cutters. Or, you can use the U-V cutters in the 7 Piece Pro Set. If you’ve already signed up for any of my free sample lessons, I will be sending you the chili flower lessons within a few weeks. To see the free chili flower sample lesson now, sign into the form below. If your gift recipient is a beginner, it’s best to give a lesson or lessons along with the tools or tools that you give. For example, the Corrugated U-Cutters would go well with the Yam and Turnip Flower lessons and the Watermelon Flower lesson. These 3 items together make a great gift. Another very nice gift for a beginner is the Thai Pro Knife along with the lessons, Carving Watermelons – Roses, Buds and Leaves. For someone who is not a beginner, the Thai Pro Knife or the 7 Piece Pro Set can make a very nice gift. Do you want to know which lessons and courses use which tools? Where is this 'Additional Information' tab that shows related lessons? This screen shot will how you where to look for the ‘Additional Information’ tab. 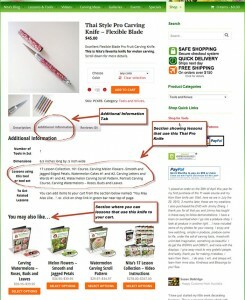 It also shows where you will find the section of the product pages that will show you where to find lessons for tools. When viewing lessons, you will see in this same section, which shows tools are used in that lesson or course. And, you will see where you can easily add a lesson, that teaching using that tool, to your cart. You can click the image below to enlarge it. Which tools are used in which courses? 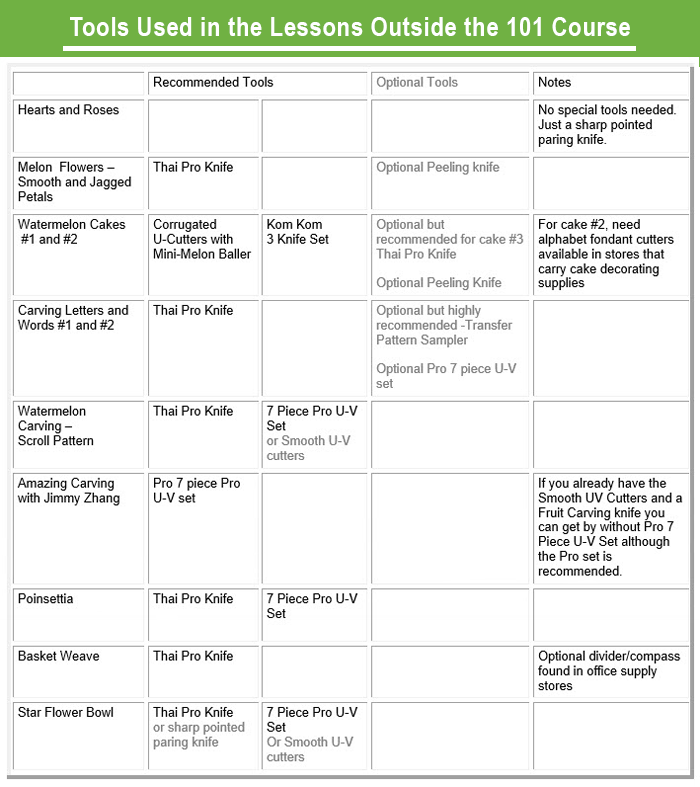 Here is a chart showing which tools are recommended for use in my various courses. Which tools are used in the individual lessons of the 101 Course for Beginners? 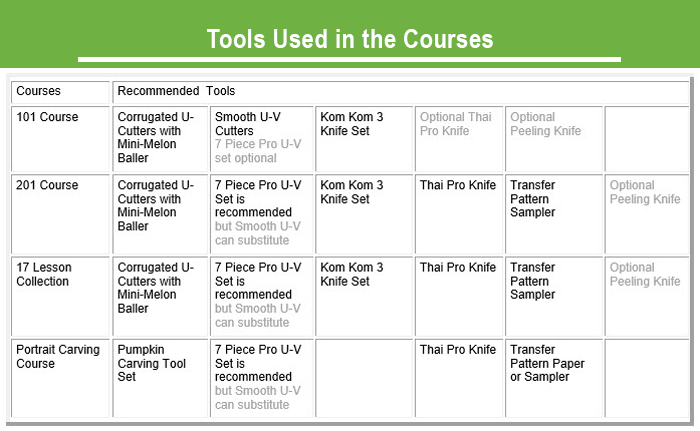 Here is a chart showing which tools are used in each of the individual lessons of the 101 Course. Which tools are used in the individual lessons that are additional the 101 Course for Beginners? Here is a chart showing which tools are used in each of the individual lessons that are not included in the 101 Course. Get them all. If you become an avid carver, you will use them all. (If you get the 7 Piece Pro set, you can skip the Smooth U-V cutters).